William Elliott A Life with Blindness: Leif Gets the Presedential Treatment. Leif Gets the Presedential Treatment. Airforce 1 at Castle Air Museum, Merced CA. 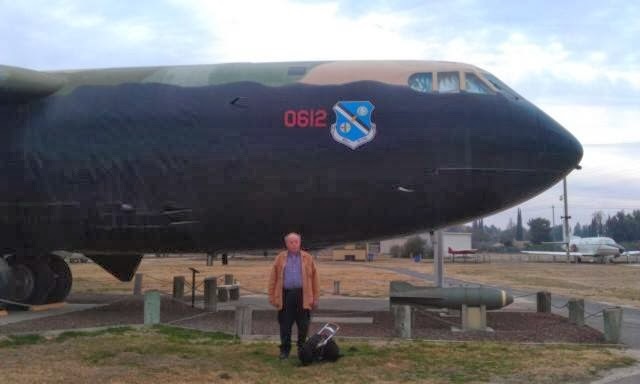 This weekend Leif, my wife and I went one a trip by train to Castle Air Museum near Merced CA. The museum is located just North of Merced, CA, close to Highway 99. The base was once part of the Strategic Air Command (SAC) and the home to several squadrons of B-52 Bombers. A few weeks ago the museum took delivery of a DC-9 which was used as a short haul, Presidential aircraft from the early 1980's until the early 2000;s, when the fleet was decomissioned. The planes carried some Presidents including Ronald Reagan, this particular aircraft was a favorite of his and so Castle Air Museum was chosen for its final home for that reason. Leif is the first Guide Dog to have boarded the aircraft, and was well behaved during his walk through. On leaving the aircraft he noted the strong aroma of Jelly Beans. We also got to see one of the bases more familiar residents a B-52G of Strategic Air Command. Beside seeing the air museum Leif also had a great day meeting lots of people who commented on his good work and behavior. We also met some people who talked to us about their experiences as puppy raisers for Guide Dogs for the Blind. Leif had especially warm wags for those people.